This video essay from Fandor was made for the Thought in Action: The Art of the Essay Film season at the BFI in August 2013. It’s creator Kevin B Lee was commissioned by the BFI to explore the somewhat indefinable genre essay film. Lee says “I spent several weeks reflecting on what the essay film is. This led to a video essay and text published via the BFI’s magazine Sight & Sound that aimed to argue for what true value this as-yet loosely-defined mode of filmmaking could bring to a world that is already drowning in media. Using the video essay to take a polemical stance was a galvanizing experience for me, as it clarified a great deal of my own sense of purpose in being a film critic in a landscape where critical opinions are abundantly available. This video features the work of Santiago Alvarez, Jean-Luc Godard, Alain Resnais and many others”. 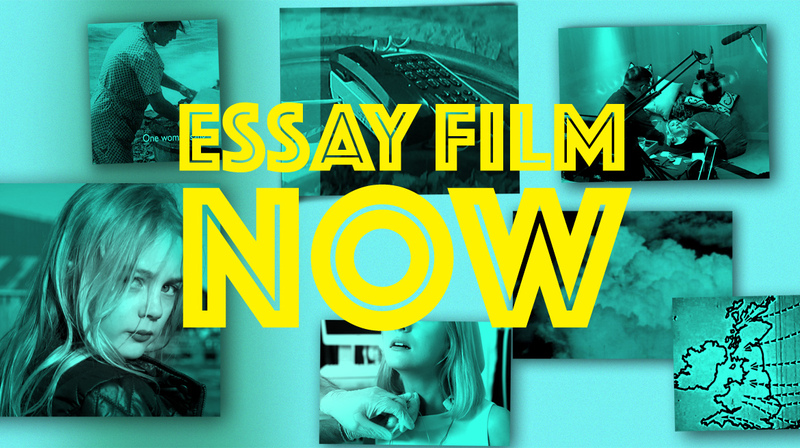 Join a special event dedicated to the art of the Essay Film, featuring the work of four diverse filmmakers shortlisted for the Arts Foundation Essay Film Award and a discussion with writer Sophie Mayer. The shortlist, comprising Charlie Lyne, Marianna Simnett, Sam Stevens and Sarah Wood each approach the genre of the Essay Film from diverse perspectives in their practice. Charlie Lyne’s films use existing footage cleverly pieced together to reveal disconcerting undertones such as in Beyond Clueless (2014). Sam Stevens‘ centres on ecological, social and political realities in Europe in his film Atlantropa (2009), which imagines a bridge across the straits of Gibraltar. Marianna Simnett uses surrealist techniques in her work to blend real and imagined events into magic-realist morality tales where she often plays protagonist undergoing significant physical duress such as The Needle and the Larynx (2016). Sarah Wood’s practice has been dominated by language. The 2014 work I Am A Spy focuses on archives, evidence and meaning. Sophie Mayer concludes the event with a discussion on the rich history of the essay film, and its contemporary diversity as seen in the work of the featured artists. Courtisane Festival 2016, 23-27 March! The themes of political cinema and the essay film will be explored in the next instalment of the Coutisane festival running from 23-27 March 2016. Pieter-Paul Mortier and Stoffel Debuysere have curated a vital selection of films over the weekend 25-27 March, including Poster Collective, Cinema Action, Black Audio Film Collective, Berwick Street Film Collective and Marc Karlin. Below are some beautifully crafted extracts from the programme. “I believe people accept there is no real alternative.” Thus spoke the Iron Lady. After the freezing Winter of Discontent came the long-awaited “winter of common sense”. An era is drawing to a close, she claimed, meaning that the time for foolish dreams and misguided actions was over. There were to be no more diversions from the one and only course worth pursuing: that leading to the triumph of global capitalism and liberal democracy. While those in power started to pursue vigorous reform programs of neoliberal economic policy and regressive social agendas, some of those who lost their bearings blamed the “bloody-minded” commoners for having invited and brought such ravages upon the dreams of another future. As the memories of struggle faded, counter-forces retreated to a defensive position, where they could merely see fit to protect the freedoms and entitlements that had been acquired with so much grit. “Wanting to believe has taken over from believing,” a filmmaker observed. But the uncertainty did not stop filmmakers from making films, just as it didn’t stop movements from occupying the spaces that the traditional counter-forces had excluded and abandoned. Instead of holding on to the plots of historical necessity and lures of an imagined unity, they chose to explore twilight worlds between multiple temporalities and realms of experience, situated in the wrinkles that join and disjoin past futures and future presents, memories of struggle and struggles for memory. This program presents a selection of British films that has documented and reflected on the changing political landscape in a period that stretched from the mid-1970s to the beginning of the 1990s. At its core is the work of a filmmaker who was pivotal within Britain’s independent film community: Marc Karlin (1943-1999). He was a member of Cinema Action, one of the founders of the Berwick Street Film Collective, director of Lusia Films, and a creative force behind the group that published the film magazine Vertigo. He also made a major contribution to shaping Channel 4 into a platform for experiment and discovery. Described by some as “Britain’s Chris Marker”, with whom he became friends, he filmed his way through three decades of sea change, wrestling with the challenges of Thatcherism, the demise of industrial manufacturing, the diffusion of media and memory, the crisis of the Left and the extinguishing of revolutionary hopes. The resonant work by Marc Karlin and the other filmmakers assembled in this program allows us to feel the pulse of an era of transition, whose challenges and transformations are still with us today. At the same time that the Iron Lady is being immortalized as “a force of nature”, while the arguments for the austerity policies that she championed are crumbling before our eyes, a time when the present is declared to be the only possible horizon, it may be worth our while to revisit this era, if only to discover that history is not past – only its telling. Special thanks to Andy Robson / Marc Karlin Archive. Nightcleaners was originally conceived by members of the Berwick Street Collective as a campaign film about attempts to unionize women working at night as contract cleaners in large office blocks. But in the process of making the film, it became, as Marc Karlin observed, a film “about distances”. Nightcleaners was originally conceived as the first of an ongoing series. Material subsequently shot for Part 2 eventually became ’36 to ’77, in which Myrtle Wardally, one of the cleaners in the earlier film, reflects on the strike and on her life, then and afterwards. Produced between 1977 and 1982, this film remained on the shelves until the BBC finally broadcast it in a sleepy afternoon slot in March of 1986. For Memory is a contemplation on cultural amnesia, written as a reaction to Hollywood’s Holocaust films, a serialisation of the genocide. Karlin asks: how could a documentary image die so soon and be taken over by a fiction? Seeing that an enormous amount of documentation exists, why did it take a soap opera to have the effect that it did? DISSENT! is an initiative of Courtisane, Auguste Orts and Argos, in the framework of the research project “Figures of Dissent” (KASK/Hogent). Q&A with Joshua Oppenheimer hosted by filmmaker Adam Curtis. The Look of Silence is Joshua Oppenheimer’s powerful companion piece to the Oscar-nominated The Act of Killing, which was screened at the ICA for 52 weeks. Through Oppenheimer’s work filming perpetrators of the 1965 Indonesian genocide, a family of survivors discover how their son was murdered and the identity of the men who killed him. The documentary focuses on the youngest son, an optometrist named Adi, who decides to break the suffocating spell of submission and terror by doing something unimaginable in a society where the murderers remain in power: he confronts the men who killed his brother and, while testing their eyesight, asks them to accept responsibility for their actions. This unprecedented film initiates and bears witness to the collapse of fifty years of silence. Agnès Varda stopped by the Criterion offices to talk about the films she made in California in the sixties and eighties. They are all collected in the new Eclipse series Agnès Varda in California, available now! The legendary French filmmaker Agnès Varda, whose remarkable career began in the 1950s and has continued into the twenty-first century, produced some of her most provocative works in the United States. After temporarily relocating to California in the late sixties with her husband, Jacques Demy, Varda, inspired by the politics, youth culture, and sunshine of the San Francisco and Los Angeles areas, created three works that use documentary and fiction in various ways. She returned a decade later, and made two other fascinating portraits of outsiderness. Her five revealing, entertaining California films, encompassing shorts and features, are collected in this set, which demonstrates that Varda was as deft an artist in unfamiliar terrain as she was on her own turf.